The giant lock is one of the most forceful and inspirational figures behind the rise of London Irish. His consistent performances have also made him one of the Premiership's most recognisable and popular figures since his debut in 2002. His ability should have brought him more recognition from Ireland, but he has played in an era when Paul O'Connell and Donncha O'Callaghan have dominated the second-row positions. Casey started his professional career at Leinster after playing for Blackrock College. He gained his first cap for Ireland in 1999 but his international appearances were stalled after gaining five caps. He eventually gained two more caps on the summer tour of 2009, against Canada and the United States. His best moments for London Irish came in the 2007-08 season when he led them to the semi-final of the Heineken Cup before losing to Toulouse at Twickenham. The Exiles reached the final of the Premiership in 2009 but lost against at HQ, this time to Leicster. 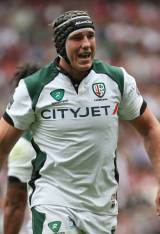 Casey was voted the London Irish 'Players' Player of the Season' in 2003-04 and was the supporters' choice in 2004-05. The lock has also found time for charity work and is a UK director for the Christina Noble Children's Foundation.